04:13 AM - brbauer2 mentioned Airborne_Ape in post Anyone use the FORScan software before? 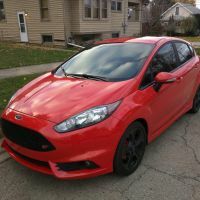 05:02 AM - brbauer2 mentioned ron@whoosh in post What did you do to your Fiesta ST today ? 02:02 AM - brbauer2 mentioned Steve@Tasca in post Will the taillights from an older fiesta work on 2016 FiST? 10:13 PM - CanadianGuy mentioned brbauer2 in post Joined the Club! 07:50 PM - brbauer2 quoted danbfree in post What did you do to your Fiesta ST today ? 04:12 PM - danbfree quoted brbauer2 in post What did you do to your Fiesta ST today ? 08:57 PM - danbfree quoted brbauer2 in post What did you do to your Fiesta ST today ? 04:55 PM - brbauer2 quoted danbfree in post What did you do to your Fiesta ST today ?